Another one of those days that are actually too hot for hiking being 29 degrees but feeling like 35. Personally, I’d rather it be minus 29 than plus when it comes to hiking. There’s always another layer that can be added in winter but unless you want to feed the local insect population, there’s only so far you can go in the summer. We found parking on the east side of the river, off of Charleston Sideroad. Parking is also available in the Forks of the Credit Provincial park. We set off following a fishing trail that we thought would lead to the Cataract Falls and the remains of the Cataract Electric Company. An archive photo of the five story building is shown below. What it led to was a long hike through poisonous wild parsnip patches and through places where the trail was impassible without fishing footwear. One of the more unusual things we have seen is a piece of plastic pipe that was running like a broken tap. The word siphon comes from a Greek word meaning pipe or tube. A siphon causes a liquid to be carried uphill, against gravity, in a continuous self sustaining flow. 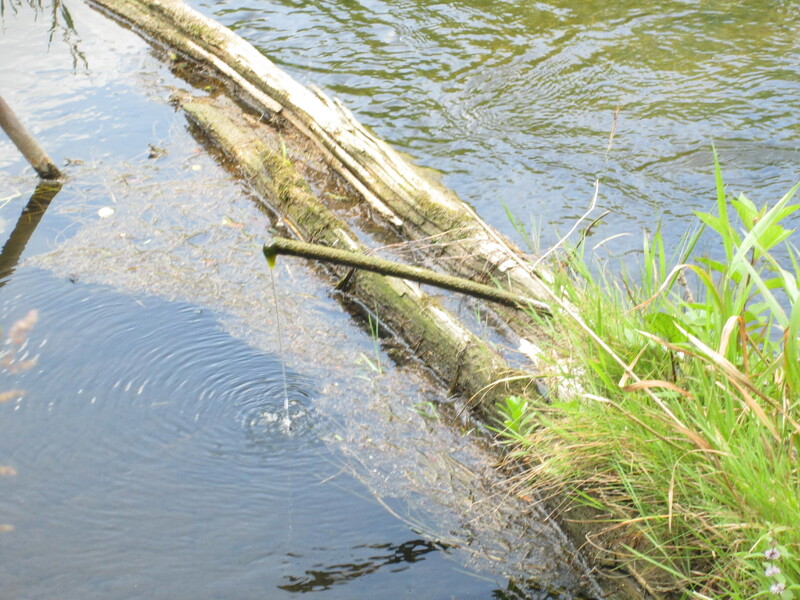 This pipe is carrying water from the river bottom on one side of the log and siphoning it over the log and back into the river. The mystery is this, how did it get started? There are several places along the river where evidence of former dams still exist. 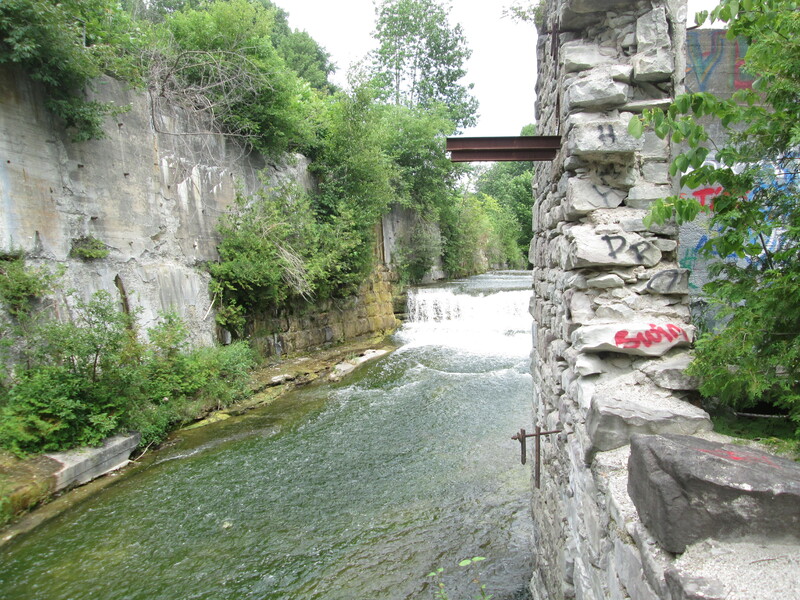 This picture shows one of these sites which is just upstream from the Quarry Dr. bridge, seen in the back ground. Another concrete structure stands on the opposite river bank just down stream from the bridge. 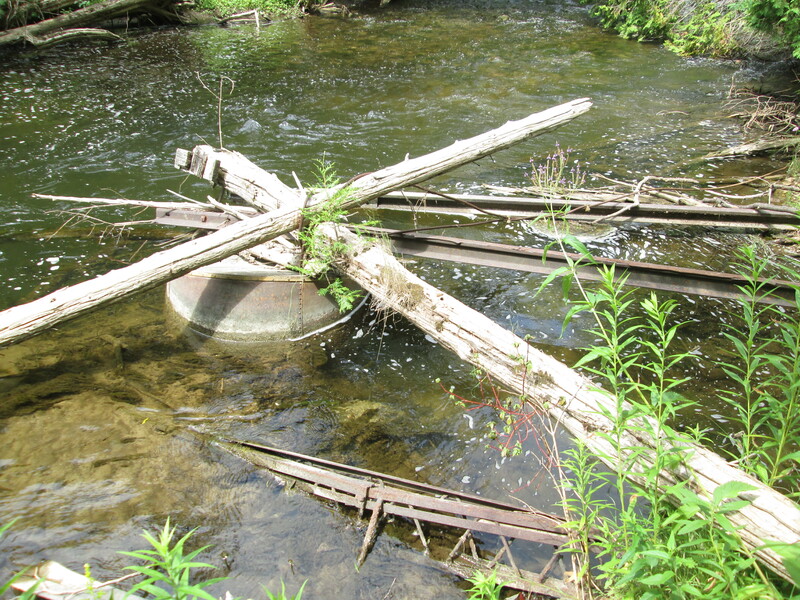 Evidence of former power transmission equipment now lays in the river a little farther along. During World War two previous styles of temporary bridges were no longer suitable due to the weight of tanks. Donald Bailey developed a system of pre-formed steel trusses that could be easily adapted to a wide variety of uses which was approved in 1940. 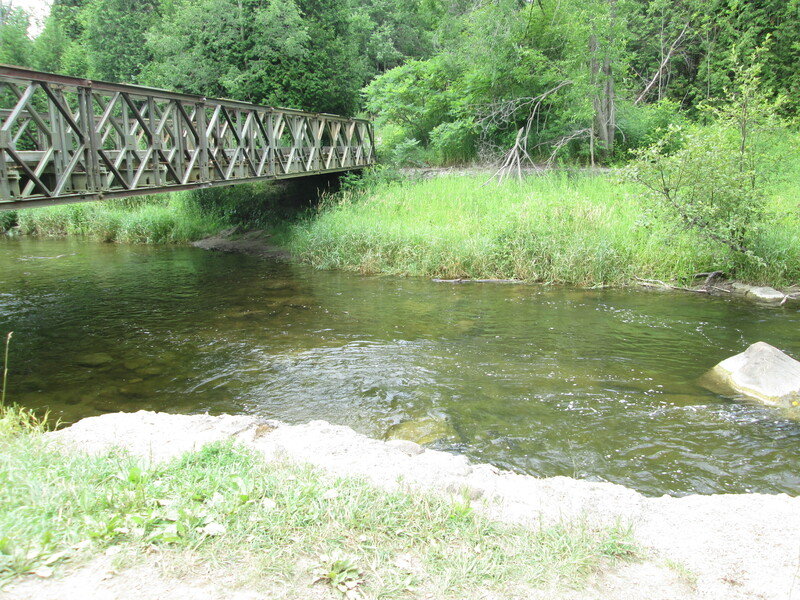 This bailey bridge was built in three days in 1999 by the Canadian 2nd Field Engineer Regiment. Foundations for a former bridge appear on both sides of the river to the right in the picture below. 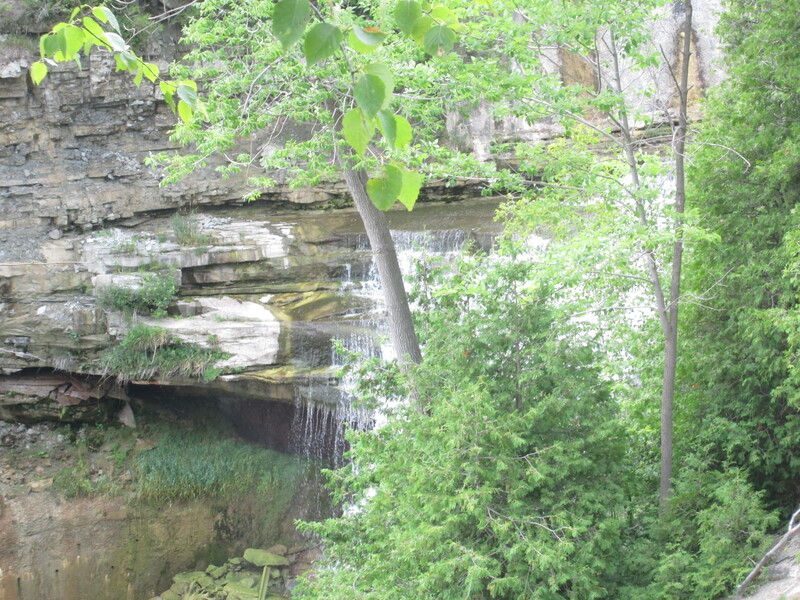 In 1818 William Grant, from Scotland, acquired the land at the falls on the north branch of the Credit River near the present day village of Cataract. The original plan for a salt mine didn’t pan out and eventually a saw mill was built. A tiny settlement called Gleniffer was started but soon disappeared. The land was bought in 1858 by Richard Church who started a milling empire at the falls consisting of saw, grist and woolen mills. The village of Churchville was born and would later come to be known as Cataract while the mill pond was known as Cataract Lake. Church’s original dam was just above the falls but it was badly damaged in a flood in 1912. After that the dam was built upstream where a pedestrian bridge now crosses on the 1912 sluice gates. 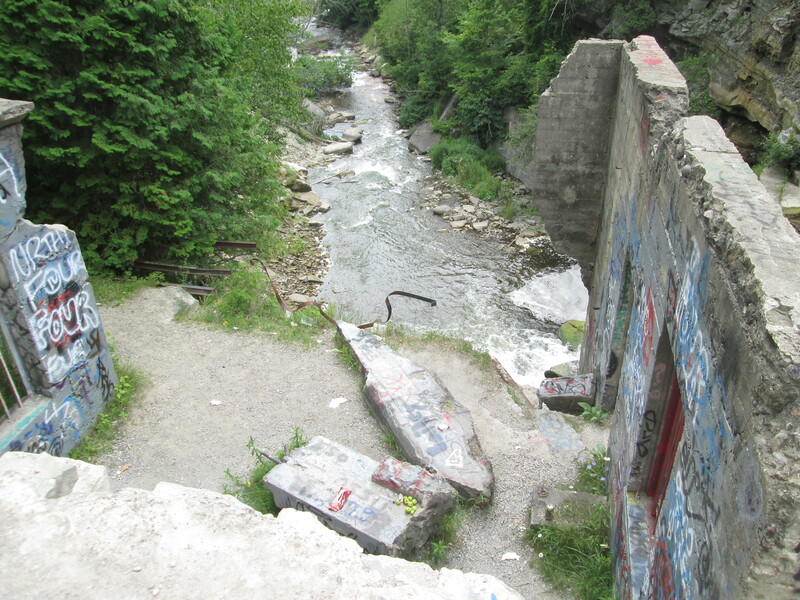 This dam was dynamited in 1953 by the Canadian Pacific Railway because they feared that a flood might damage the tracks that run along the western side of the river gorge. 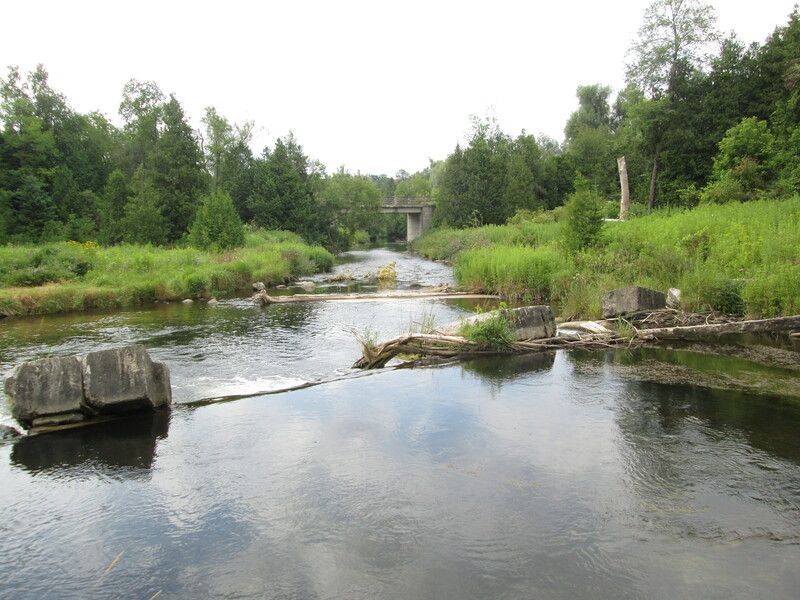 Just a year later Hurricane Hazel destroyed dams and bridges throughout the GTA. The Credit Valley Explorer scenic rail tour now runs along these tracks. Church built his sawmill out of wood and it was destroyed in a fire in 1881. The Wheeler brothers rebuilt it as a three story stone grist mill. This mill didn’t last and was destroyed by fire in 1885. John Deagle purchased the property in 1890 and built a 5 story grist mill on the same foundations. He soon closed the grist mill and converted the structure to the production of electricity. As you approach the remains of the building a large electrical pole is down on the ground. 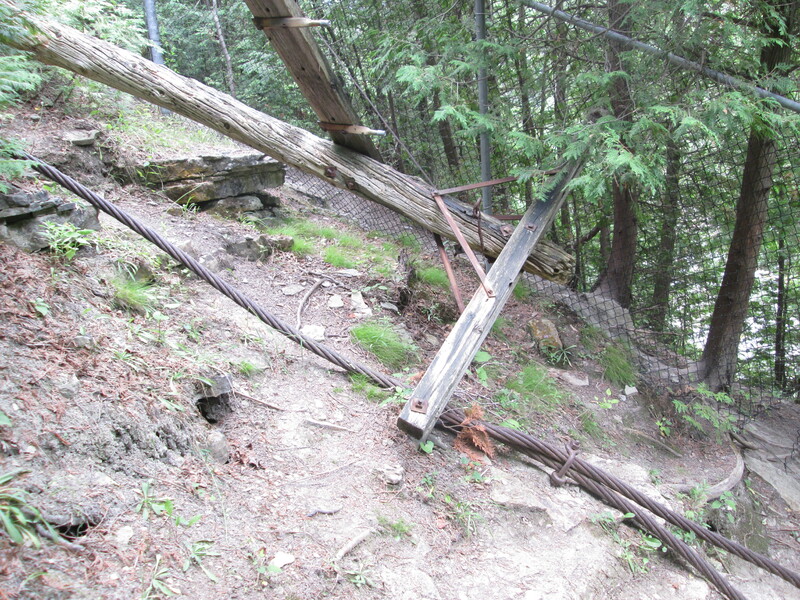 The cross beam carried many glass insulators, all of which have been removed. A cable over an inch thick lies on the ground here as well. Deagle produced his first electrcity from the Cataract on Nov. 2, 1899 under the name of The Cataract Electric Company Limited to light three experimental street lamps in town. Due to right-of-way negotiations he supplied electricity to the farm on lot 5, concession 5 in Caledon making it the first farm in Ontario to have electricity. In 1904 he signed contracts to bring electricity to the villages of Erin and Alton and eventually carried it as far as Orangeville. He also supplied the Cheltenham Brickyards. The view below looks out of the end of the power plant, beyond the falls, to the river in the gorge below. Cataract Falls drops 21 meters over the side of the escarpment here and can be seen in the cover photo as it cascades over the falls. After the flood of 1912 Deagle rebuilt his mill but sold the power plant just three years later. After several ownership changes it was under the control of the Caledon Electric Company by 1925. Ontario Hydro purchased the property in 1944 but due to low water levels they shut the facility down in 1947. The wall below has original Wheeler Brothers stonework in it while the poured concrete in the picture above is a later addition. The water fall upstream is the site of the pre-1912 dam. The riverbank has been reinforced twice to protect the CPR tracks above. The earlier work was done with cut stone and is at water level just below the dam. Concrete was a 20th century addition. 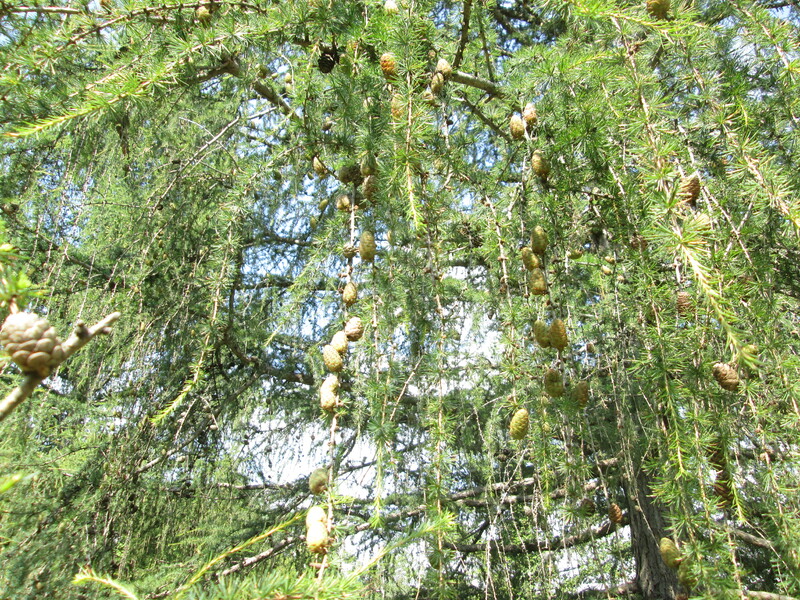 Eastern hemlock grows in selected spots in the park. It is known as a high yield cone producer and this year appears to be a good year. We took the trail from the power station directly back into Cataract. It comes out close to the Cataract Inn. The window above the door on the left that says Cataract Inn is composed of stained glass. 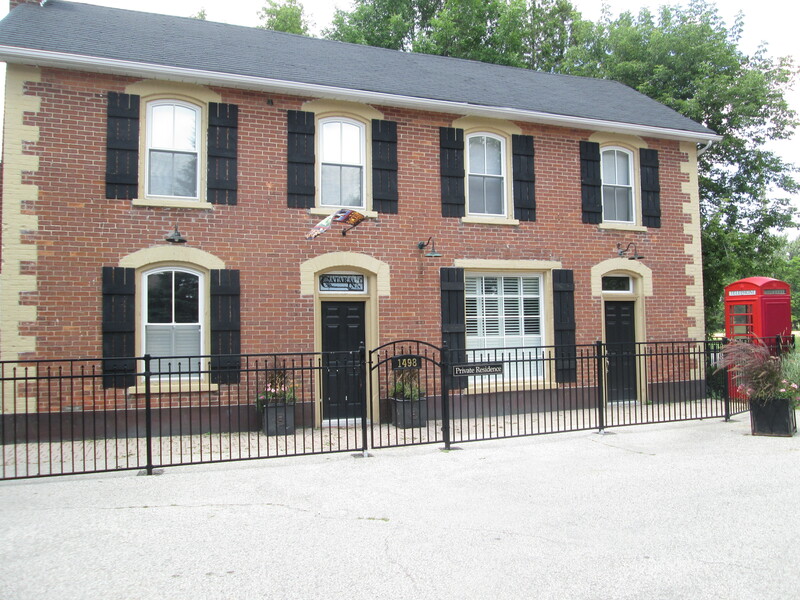 This was known as the Horseshoe Inn in the late 1800’s. The window over the door on the right has 1855 written in the glass to denote the date of construction. A parting shot of the water dropping off the shelves of shale near the remains of the Cataract Electric Company. Also check out the top 15 treks in the first 100 posts here. 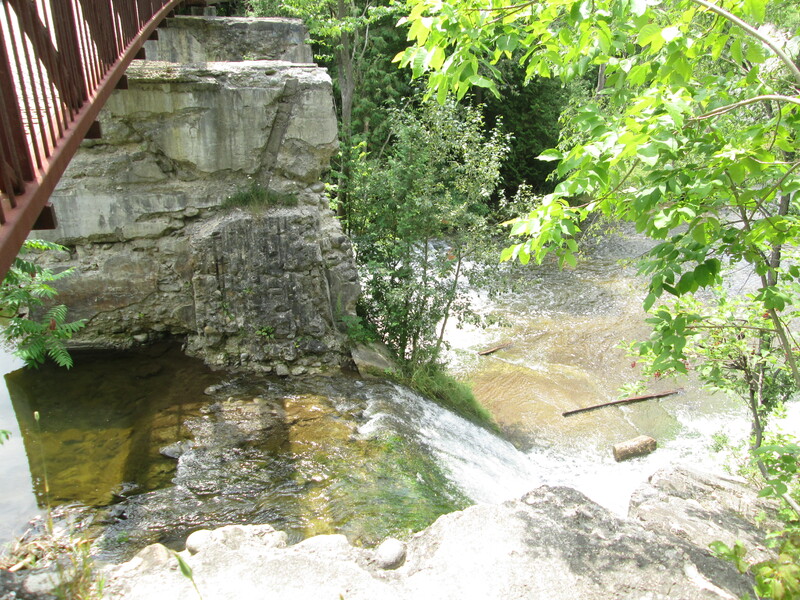 This entry was posted in Credit River and tagged Bailey Bridge, Cataract Falls, Cataract Inn, Church's Falls, credit valley explorer, Eastern hemlock, Forks of the Credit Provincial Park, hurricane hazel, Quarry Road, siphon on July 28, 2015 by hikingthegta.